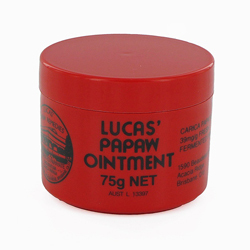 This petroleum based ointment makes an ideal lip balm and moisturiser, and is a perfect travel product. I suffer extreme dry skin periods and following a TV article I decided to buy 2 tubes. They have lasted ages, just a small amount for a couple of days applied and the skin becomes normal for weeks. Highly recommend this item, so much so I am now looking to buy the larger tub size.